See our other post on pinch pots. This project was put together in one day. We let the greenware get bone dry. Fired in kiln from 04 slow to bisque. Glazed the bisque and fired from 06. When was the last time you did a clay lesson? It is pretty therapeutic for all involved. Our classroom teachers and staff like to get in on the learning fun. Have ever invited your administration to your classroom to make the project you were introducing to you class? If not, you should! Great article in the link above! In recent years, as budget concerns reduced art programs in schools (in particular elementary schools), there has been a great deal of research about the importance of art in child development. From my own experience as an artist and ceramic teacher, I believe that few art mediums kindle growth and skills in children in the way that clay does. At Lakeside Pottery Ceramic School and Studio in Stamford CT, I have taught children (ages 6 to 15) for the last several years. During that time, I have witnessed firsthand how invaluable the experience of working with clay is for sensory development, motor skills, self esteem, and self expression, problem solving skills, discipline, and pride. Clay also has a uniquely therapeutic quality that I have seen settle and calm children; it retains their attention for hours. There is no better moment for me than witnessing a child’s joy as they sit at the potter’s wheel for the first time and place their wet hands on slowly spinning clay! Clay, and its necessity to be touched, is at once familiar to children. The sensory experiences they encounter in our pottery studio are numerous and as they experience the texture and feel of the clay, the students express what they are sensing with uninhibited enthusiasm; “It’s cold, it’s wet and squishy, and it’s so heavy!” Clay asks to be poked, pinched, twisted and rolled and as they handle it, children develop both fine and major motor skills and realize that they have an effect on the clay as it responds to their manipulation. Children visually inspect the clay’s surface and color, they smell it and they laugh at the sounds it makes when it’s wet. For many, it’s perhaps the first time they’ve been encouraged to get wet and dirty in a classroom environment and there is an instinctive and uplifting response to the freedom they feel. 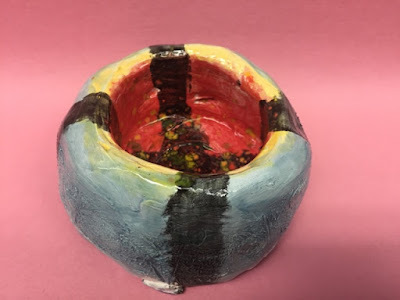 Even when the finished product is ready to take home, the children hold and cradle their work, smoothing their fingers over the now colorfully glazed surface as they turn it around and around for inspection. From my experience as an art teacher, I believe that clay is a unique art medium because it is highly responsive to touch and very forgiving. As soon as children are given clay, they immediately begin to mold and shape it. They become aware that they are in charge and have influence over the medium as it is quick to respond to their fingers. The feeling that they are in command of the clay gives the students the confidence to attempt any project which opens the door to greater self expression and imagination. Clay also allows a child to learn to repair mistakes and therefore not be afraid to make them. Making mistakes is essential for self improvement but can be difficult and even an obstacle for some children. The forgiving quality of clay, and therefore the ability to readily fix mistakes, gives the child a sense of control over their project’s success which improves self esteem and self expression as they realize that mistakes aren’t going to stop their progress. For example, during a class, a boy had been working on his project, a toothbrush holder that looked like a baseball player, for over two hours. All of a sudden he accidentally pierced a hole right through the side of the project while decorating. He looked up at us devastated. 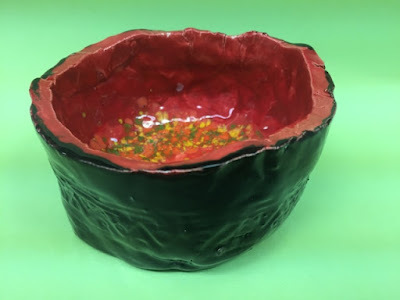 But as I showed him how to take a piece of clay and fill in the damaged area, he suddenly took the clay from my hand and stated, “I can do it myself!” He repaired his piece and went on decorating with fervor. Our children’s after school programs are two hours long and our summer camp classes run for three hours. I have many parents who express concern that their child might not be able to stay on task for that long, however the opposite is always true. While I have worked with students in other art mediums, something magical happens when children work with clay. Whether it is the sensory response to the clay, the ability to be in charge of the medium or, perhaps, the ability to express and articulate their emotions through their physical prodding or smoothing of the clay, all children, even those with high activity levels, become engaged and engrossed in their work. The class of twelve children is composed and quiet and the hours melt away. The children don’t experience frustration or disappointment because the clay is flexible and compliant. While I am unaware of research in this area I can attest to the calming and healing results as I have seen them at the studio time and again. At Lakeside Pottery, we all teach ceramics with the philosophy that the process is more important than the product. 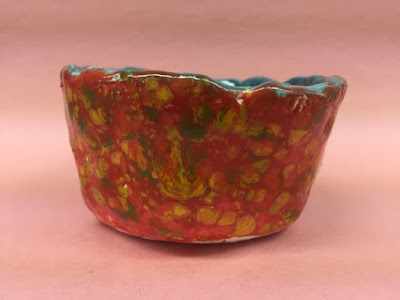 I place emphasis on the discovery and joy of creating, however, there is an excitement for children as they make their mug or pencil holder and announce that it’s for their grandmother’s coffee or for their dad’s desk. The functional and durable nature of the finished stoneware clay gives children a feeling of significance and pride. I will often give the students the option of putting glass chips in the bottom of their bowls or plates as part of the glazing process. When I explain that though it is beautiful, it might make the piece not safe for food, many children say no to the glass because it is important for their bowl to be used as a center piece at their table. 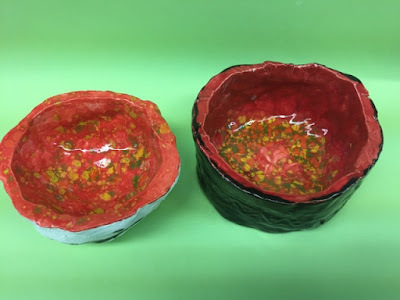 All forms of art are important for children to experience, yet it does seem that the long-lasting nature of the children’s finished clay piece adds a special value for them. 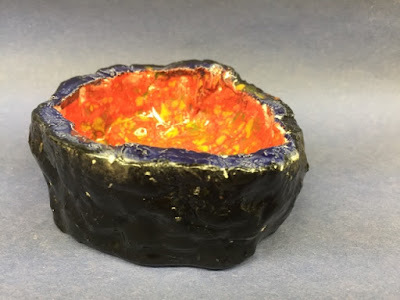 We often ask parents what artistic creation their mother has kept on her shelf for years, and they all answer that it is the pottery they made in grade school. It is always fulfilling for me to introduce clay to children and watch its unique qualities contribute to their development in so many ways. Knowing how valuable clay is to children’s achievements and because it is discouraging to see limits put on our children’s school art programs, Lakeside Pottery has helped schools start clay curriculums; worked with children with special needs, trained teachers to work with clay, assisted in purchasing and setting up equipment, and helped plan and design school studios. 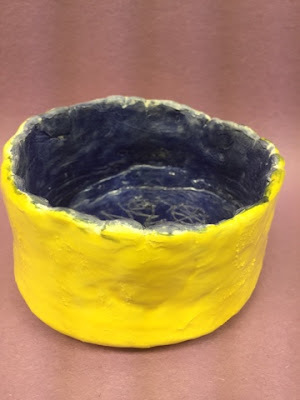 We have shared the clay experience both in outreach programs in schools and children’s workshops within our studio with the belief that clay is an essential element for nurturing children’s growth. Handprints with Dots Rockin' On!